How does Arthur Miller present family loyalty and conflict in A View from the Bridge? A View from the bridge is a play comprised of many complicated and intertwined relationships in 1940’s New York. As the main male characters are Italian, they have ancient moral values pertaining to loyalty and trust; not just within the home environment but within the wider community as well. “Beatrice: What do you want from me? They’re moved out, what do you want now? Eddie: I want my respect! Beatrice: So I moved them out, what more do you want? You got your house now, you got your respect. 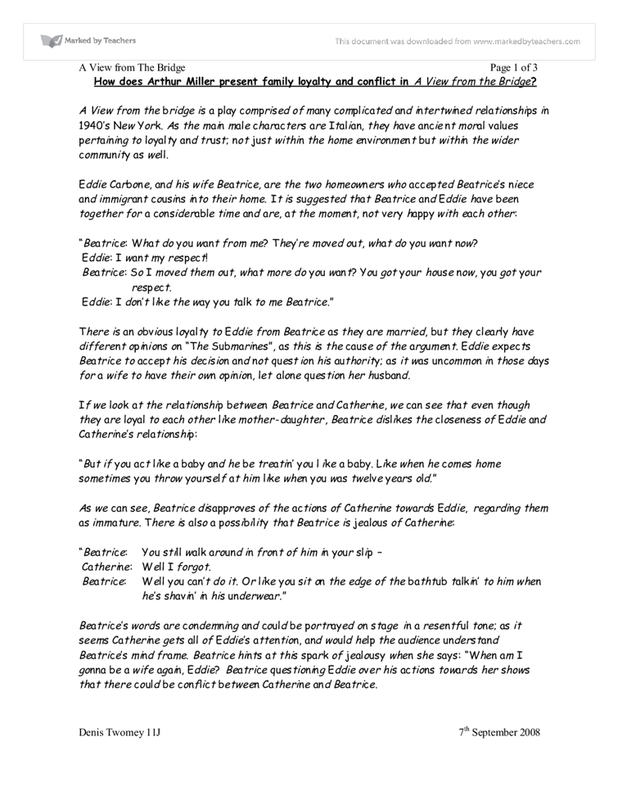 There is an obvious loyalty to Eddie from Beatrice as they are married, but they clearly have different opinions on “The Submarines”, as this is the cause of the argument. Eddie expects Beatrice to accept his decision and not question his authority; as it was uncommon in those days for a wife to have their own opinion, let alone question her husband. 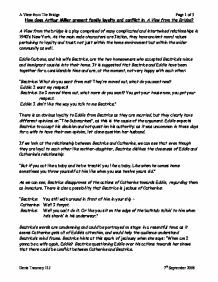 Beatrice’s words are condemning and could be portrayed on stage in a resentful tone; as it seems Catherine gets all of Eddie’s attention, and would help the audience understand Beatrice’s mind frame. Beatrice hints at this spark of jealousy when she says: “When am I gonna be a wife again, Eddie? Beatrice questioning Eddie over his actions towards her shows that there could be conflict between Catherine and Beatrice. “Catherine: But it’s fifty a week, Eddie. From this stage direction, we can assume that Eddie has a feeling of love or lust towards Catherine. When Rodolpho is introduced as a character, Eddie feels jealous that Catherine has feelings for Rodolopo and so tries to remove the threat. Eddie does this by accusing Rodolpho of trying to gain citizenship by marrying Catherine under false pretences and questioning Rodolpho sexuality. At this time, homosexuality was frowned upon (and illegal in some states) and many men accused of being gay were shunned by society. There is no doubt that Alfieri could bail out very quickly, yet he would not until Marco promised not to get revenge on Eddie. Alfieri knows of Marco’s ethics and fraternal loyalty: Marco would seek vengeance on Eddie as soon as he was bailed. However, Alfieri also knows that if Marco promised not to do something, he would not do it. Nevertheless, we see that even though Marco promised to not harm or go near Eddie, he breaks this promise to Alfieri and eventually kills Eddie; just to uphold his family honour. In conclusion, Arthur Miller presents us with a complicated web of family ties. Marco and Rodolpho’s arrival creates a lot of dramatic tension between the characters, mainly centred on Eddie. His mixed emotions of lust towards Catherine, anger at her wedding to Rodolpho coupled with a sense of family loyalty drive him to phone Immigration and get Marco and Rodolpho arrested (ironically it is Eddie who warns Beatrice and Catherine of the dangers of letting immigration know about “the Submarines” and the eventual consequences). In the end, Marco does uphold his family honour but breaks his promise to Alfieri by killing Eddie. &amp;quot;A View From The Bridge&amp;quot; examining tension and conflict within the play. Here stage direction representing this; "Marco is face to face with Eddie, a strained tension gripping his eyes and jaw, his neck stiff, the chair raised like a weapon over Eddie's head - and he transforms what might appear like a glance of warning into a smile of triumph, and Eddie's grin vanishes as he absorbs this look". Stop that. Have respect for her." Rodolfo obviously thinks that what Eddie is doing is wrong and he is trying to stop him. Like I mentioned before, Catherine lives in the same apartment as Eddie, and they get along really well, in fact a little to well. Miller uses this scene which has an almost a soliloquy-like effect where Eddie talks to the audience of his thoughts, which are extremely one-sided and as revealed at the beginning of the play paranoiac of Catherine where he interprets "just humorous" as they are laughing at him but they dare not say "because they know he's [his] relative." Eddie starts picking on Rodolfo from the first night. He is jealous of Catherine�s attraction to Rodolfo, and this is taking her attention away from himself. Eddie uses Rodolfo�s illegal status against him and exercises his authority over him. He is frightened of Eddie's reaction to things that he does. One example of this is when he is asked to dance by Catherine, "(in deference to Eddie) No, I - I'm tired." When asked to box Rodolfo is embarrassed, " Well, I don't know how to". My evidence of this is: "Beatrice - when am I going to be a wife again Eddie? Eddie - I aint been feeling good. They bother me since they came. Beatrice - its almost three months you don't feel good; they're only here a couple a weeks. We are shown how there is great potential for tragedy and the common man, "I believe that the common man is as apt a subject for tragedy in its highest sense as kings were", Miller explores how it is not just kings and kingdoms that can be affected by tragedy, there is potential for domestic tragedy within the family home.